In the design of the new cultural district between the new opera house and existing city hall, the main goal was to increase outdoor comfort and create dynamic, social pedestrian routes. The lake waterfront is aesthetic with a dramatic view to both the opera house and exciting museum, gallery and library frontage. Avenues of trees and planting shield the waterfront from the cold Mongolian winds while at the same time storing water for irrigation. The lake is a stormwater feature, a balancing pond which can effortlessly handle a 1 in 10 year storm event and buffer a 1 in 100 year storm event. Generous tree plantings link subsurface, decentralised retention trenches which feed the lake via a cleansing biotope. 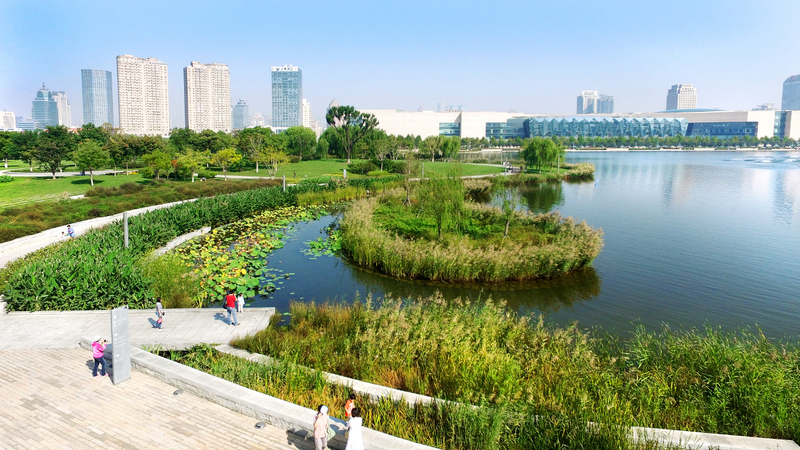 The urban lake has its own natural biology and reduces temperature extremes. Its scenic beauty sets the scene for Tianjin’s most outstanding new cultural architecture.